Islamabad, Oct 28, IRNA – A prominent Pakistani religious scholar on Monday strongly condemned killing of Iranian border guards by armed bandits at Iran-Pakistan border and urged the government of Pakistan to cooperate with Iran to punish the culprits. Talking to IRNA, patron in chief of Imam Khomeini Trust (IKT) Allama Syed Iftikhar Hussain Naqvi said that the objective of the terrorist act is to create misunderstanding between the two brotherly countries. Some 14 Iranian border guards were killed in heavy clashes with terrorists in the southeastern province of Sistan-Baluchestan on Friday night. Iran has already protested to the Pakistani government over negligence of terrorist movements on common borders. Director General of the West Asia Department at Foreign Ministry gave a note to Pakistani charge d’affaires on Saturday to convey Iranian protest to the Pakistani government for negligence about the terrorist elements coming from Pakistani soil to Iran border. Allama Syed Iftikhar Hussain Naqvi expressing his views said that everybody in Pakistan is in the state of shock over the heinous crime. “Terrorists do not belong to any country,” said Managing Director of ‘Such TV’. He also expressed condolences to the bereaved families of the victims on the sorrowful occasion. The scholar went on to say that the government of Pakistan must take extra measures to make Iran-Pakistan border safe and confront the bandits. He added that terrorists behind the act are agents of the Zionist Regime and their objective is to create misunderstandings between the two neighboring states. He demanded Pakistani government to immediately take action against the terrorists and unveil the conspiracy to disturb Iran-Pakistan relationship. Naqvi was of the view that sanctity of mutual security cooperation pact must be maintained. 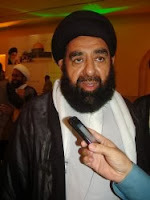 “Iran is our brother and Pakistani soil should not be used for any terrorist act inside Iran,” noted the analyst.